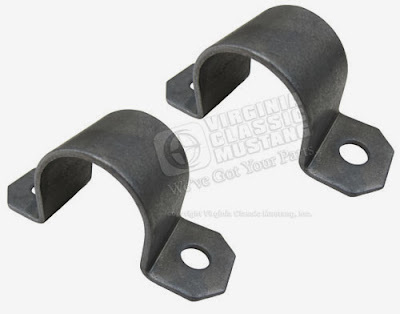 1965-66 GT350 Shelby Mustang One Inch Sway Bar Bushing Mounting Brackets. Made exactly like the originals from assembly line parts. Made in the original .103 inch thickness like the assembly line brackets rather than the NOS ones that are only .091 inch thick. Virtually impossible to tell from the original. Original Ford part number is C0DD-5486-A. Come in the original bare metal finish with a hard (undetectable) protective coating to protect the finish. Our Part Number is SU-3211. Perfect compliment to our SU-321 Exact Reproduction Bushings.